Some vacation destinations attract tourists. Others attract outdoor athletic disciples. Lake Placid and the Adirondacks attract both. It is the latter variety however, who will be most excited about the new online community founded in Lake Placid, Xoona.com. The brain-child of local outdoor enthusiast, Peter Fish, Xoona offers "racing for everyone" with self-timed races on courses developed by local experts. Fish's ultimate goal is to develop a national network of 'hubs' that will allow people to race anywhere in the country. The pilot location for the project was established this past fall when Xoona partnered with Placid Planet Bicycles and created the first Xoona racing hub in Lake Placid. 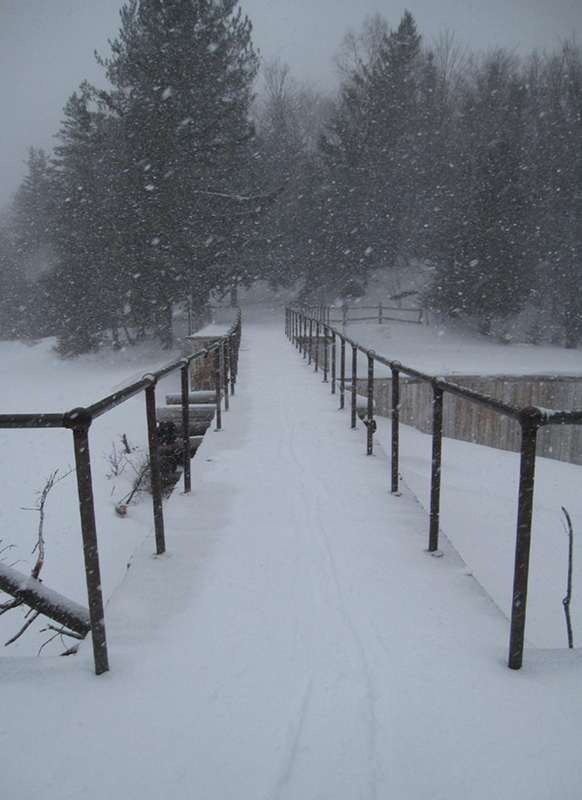 Lake Placid's decades-long history of hosting international caliber competitive athletic events allowed Placid Planet's owner, Kenny Boettger, to create more than forty self-timed race courses in a variety of endurance sports. From the Ironman swim course in Mirror Lake, designated running routes, a road bike time trial, to a couple of backcountry downhill races courses, the self-timed competitive options available are designed to appeal to all types of endurance athlete. The Xoona concept is simple and works like this: "join Xoona, race for free, submit times, view results." My personal interest in Xoona began when a friend's post on Facebook caught my eye. He wrote he had participated in a fun "backcountry downhill ski race." Although I've participated in many organized cross-country ski races over the years, the solitude of the backcountry has always been more appealing than interval training. Since I admit to being just a tad competitive in nature, love going downhill fast, and enjoy the challenge of skiing Mother Nature's slalom gates, this Xoona backcountry downhill ski race sounded like something worth investigating. The mogul section of the Xoona backcountry downhill race at Avalanche Pass. 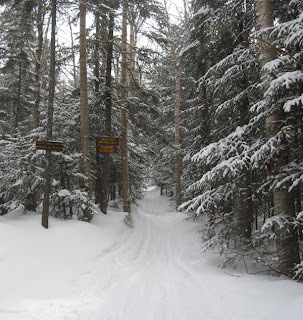 Xoona.com offers two backcountry downhill ski courses from which to choose. The first course is on the Jackrabbit Ski Trail at the Whiteface Inn Road in Lake Placid and starts at the Placid Lean-to at the height of land and finishes at the DEC sign-out. 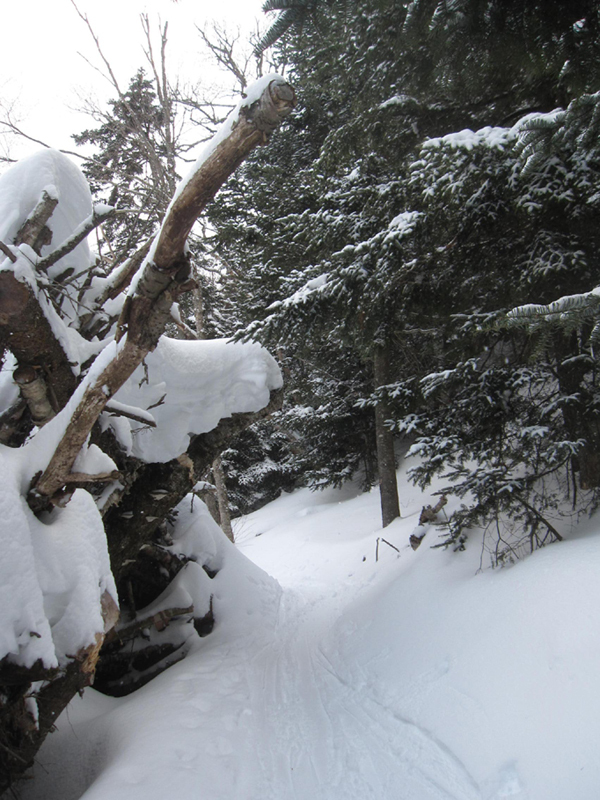 The second designated backcountry downhill course is in the High Peaks and is the descent from Avalanche Pass to the Marcy Dam Pond. It was an easy and obvious decision to choose which course to ski as my first Xoona race. I couldn't wait to time my favorite quickee backcountry ski - the descent from Avalanche Pass to Marcy Dam Pond. A few weeks ago on March 2, I had the time and the mountains had the snow, so I headed into the backcountry for my first Xoona race. Armed with my 25-year-old faithful Karhu XCD GTs and my sport watch, I was looking forward to an interesting few hours of climbing, solitude, and speed. The start house for the Xoona backcountry downhill ski race at Avalanche Pass. The debris pile at the bottom of the slide on Mount Colden on the Avalanche Pass ski trail is the designated start house for this course. Like all downhill start houses, this one is located at the height of land. As any downhill racer will tell you, the wind blows colder and stronger at the start building. This is where racers strip off their warm-up layers and stand shivering in race lycra waiting for the start official to count down to their start. For a backcountry downhill race, the process is just the opposite. Because you climb up the mountain using human power instead of riding a lift, you usually arrive at the height of land, or at the start in this case, stripped down to base layers to avoid overheating. After my climb, I dallied at the "start house" to add warm layers of clothing for the descent and fortified myself with hot mocha and a snack, while pondering my downhill strategy. Pondering my strategy did not take very long since after 25 years of course inspections, I already knew how to ski this course. 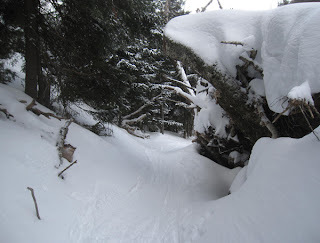 The idea was to simply point my skis down the hill and turn only when the trail turned. The challenge for me was having the gumption to actually perform this without skidding a turn or slipping in a stem christie when the speed seemed out of control. The finish line of the Xoona backcountry downhill ski race at Avalanche Pass. I can't say I had all the gumption required to ski as fast as the mountain and my skis allowed, but I made it to the "finish" at the Marcy Dam Pond giggling with exhilaration and trembling quadriceps. My time was nothing to write home about but it was one of the most enjoyable "ski races" I have ever completed.